Crude oil is a complex mixture of hydrocarbons. Hydrocarbons are chain molecules of varying lengths made from hydrogen and carbon atoms only. Crude oil has no uses in its raw form. However, it is used as an important source for fuels and as a feedstock for making chemicals (including polymers – very large chain molecules made by joining many smaller molecules together, end to end) for a wide range of consumer products. Almost all of the consumer products we use involve crude oil in their manufacture or transport. Crude oil was formed from the fossilized remains of dead plants and animals and therefore is called a fossil fuel. It is a finite (limited) resource. The continued use of crude oil at the present rate will result in it running out in the future. Fossil fuels take many millions years to form and are currently being depleted (used up) much faster than new ones are being formed. Energy derived from crude oil is called non–renewable energy because once used up it cannot be replaced. Crude oil is a vital resource, and current rates of usage are not sustainable in the long term. Therefore, many scientists, engineers and politicians are working to find and implement alternative solutions to reduce current demands. An example of this along with environmental drivers is the use of non-renewable energy sources such as wind and solar for the generation of electricity. 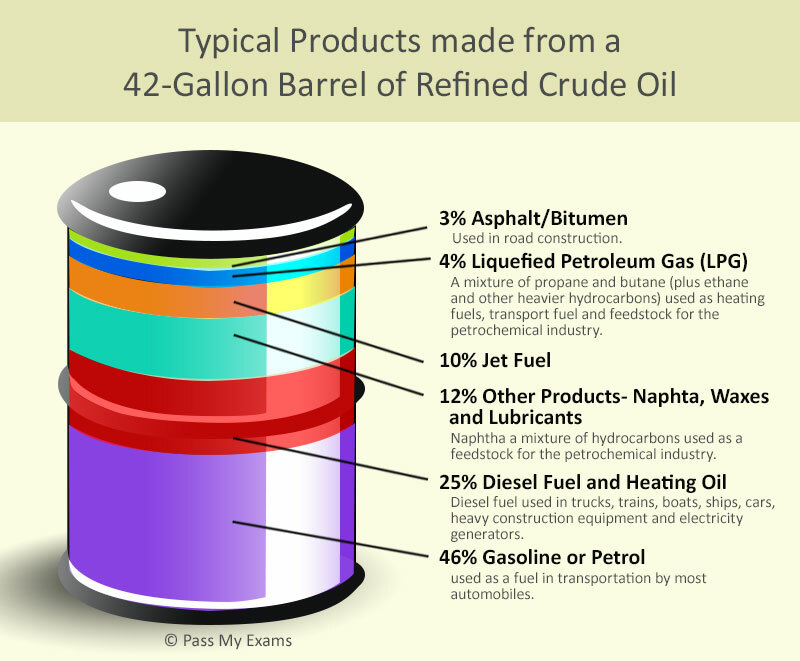 The image below gives the typical product breakdown for a barrel of refined crude oil. However the percentages may vary slightly depending on the source location from where the crude oil was extracted.